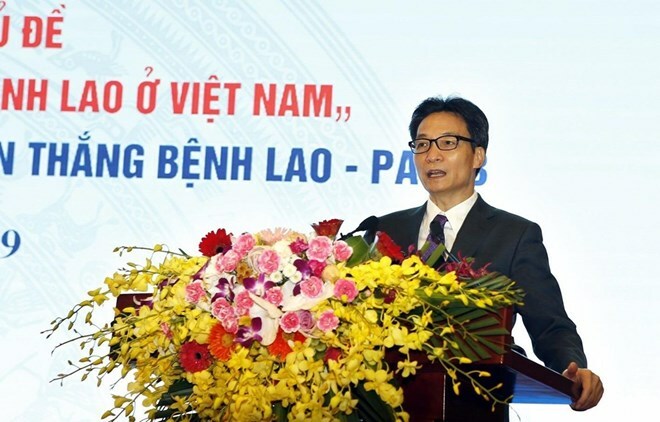 Hanoi (VNA) – Deputy Prime Minister Vu Duc Dam has requested stronger and more effective actions to wipe out tuberculosis (TB) by 2030 at a ceremony held in Hanoi on March 23 in response to the World Tuberculosis Day 2019. “We need to do better communication work to raise public awareness of TB which takes many lives each year. Although TB is an infectious disease, it is treatable and curable thanks to the medical technology advances”, he stressed. Financial mechanisms as well as application of new technologies and treatment should be encouraged while people from all walks of life should be engaged in the fight against TB, he added. According to Prof. Dr. Nguyen Viet Nhung, head of the National TB Prevention Programme and Director of the National Lung Hospital, Vietnam is in the world’s top 30 countries with high TB burden. The country ranks 16th in the number of TB patients and 13th in the rankings of drug-resistant TB patients. Seventy percent of the TB patients are of working age (between 15 and 55). The World Health Organisation (WHO) estimated that there were 124,000 new TB cases in Vietnam in 2017. During that year, the disease killed 12,000 people, much higher than the number of fatalities due to traffic accidents the same time. Thanks to the national strategy on TB prevention, coupled with advanced diagnosis system, the TB cases in the country fell dramatically. In the past decade, TB cases drop 31 percent, average 3.8 percent each year. The WHO said that Vietnam is on the right track to end TB by 2030. However, Nhung said that the TB prevention programme is facing various challenges, particularly in maintaining sustainable achievements until 2030, and engaging the society in the fight against TB.